While We're Young is very funny at any age. Writer/director Noah Baumbach's latest film is full of multigenerational energy and his trademark comedic intellect and style. 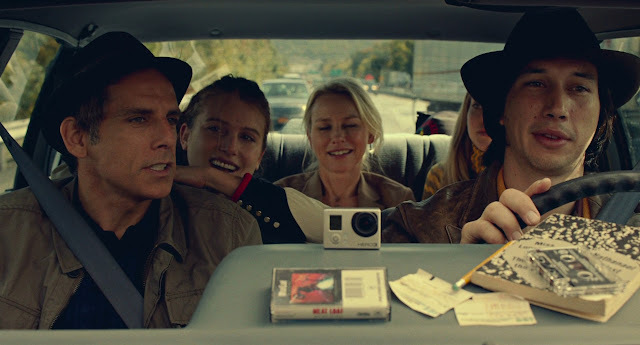 Reteaming with his Greenberg collaborator Ben Stiller, Baumbach takes a simple premise and themes of getting older, being in your forties, baby fever, and wasted youth to mine very pertinent, topical material. The film uses the lens of three generations of artists to reveal our anxieties and insecurities on life and success sublimely. Josh and Cornelia, Stiller and a versatile Naomi Watts, do fine work as a believable and identifiable married, childless couple who are comfortable yet slightly unfulfilled. Adam Driver and Amanda Seyfried contrast the older pair with their hipster appeal and nostalgic zeal. Driver as a young, ambitious documentarian really shows all the dimensions of contemporary millennial culture, their subtle sense of entitlement, and a simultaneous reverence and lack thereof for the artistic process. Stiller and Watts' characters soon become enthralled by the possibilities of youth and reliving it. A grizzled Charles Grodin (as Cornelia's father and Josh's former mentor) even shows up to balance the talented cast out and display a welcome gravitas and wisdom amidst emotional chaos. These performances are intercut with Josh and Cornelia's isolation from their best friends, Fletcher and Marina, played by Adam Horovitz (Ad-Rock from the Beastie Boys) and Maria Dizzia and their life with a new baby. All these diverse talents from different backgrounds really enhance the material with fluid performances that give the film a good sense of character momentum despite a few strange yet amusing comedic turns. Baumbach does his most mainstream, least caustic work to date while showing his maturity and thoughtfulness first seen in Frances Ha. It's hardly a coincidence Stiller plays a filmmaker in his forties (a natural stand-in for Baumbach, himself) whose career goes through productive resurgence inspired by a younger filmmaker and collaborator (similar to Baumbach's real-life partnership with actress Greta Gerwig). While masquerading as a pseudo midlife crisis film, While We're Young is full of thoughtful, charming comedy aiming at every generation. Baumbach ups the topical wit with gentle humour and enthusiasm. It does so much better and gracefully in 97 minutes what Judd Apatow tried so hard to do and say in well over two-hours of This Is 40. The film is so original and rich in its thematic exploration of adulthood, popular culture, and how we perceive the art we consume.